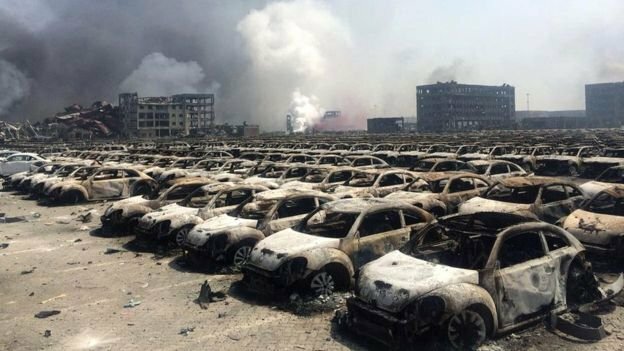 At least 44 people are now known to have died, and more than 500 injured, following two major explosions in China's northern city of Tianjin. Twelve firefighters were among the dead, China's official Xinhua news agency said as it reported a doubling of the death toll. Two blasts happened in a warehouse storing "dangerous and chemical goods" in the port city of the area. A huge fireball lit up the sky, and nearby buildings have collapsed. President Xi Jinping has urged "all-out efforts" to rescue victims and contain the fire, Xinhua reports. The first explosion at about 23:30 local time (15:30 GMT) on Wednesday was followed by another, more powerful blast, seconds later. Shockwaves were felt several kilometres away. Senior managers of Ruihai Logistics, which owns the warehouse where the explosion happened, are being questioned by authorities, state media reports.